2003 - Engineering Degree from Polytechnic University of Marche (Italy), obtained with the highest grade. 2006 - PhD in Mechanical Engineering from Polytechnic University of Marche (Italy). 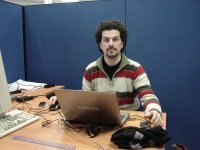 2007 - Research assistant at the Polytechnic University of Marche (Italy). 2009 - 2 months post-doc contract at MIT (USA). 2009 - Post-doc at �cole Nationale Sup�rieure d�Arts et M�tiers (ENSAM) in Ch�lons en Champagne (France). PhD on ductile fracture of sheet metals. Calibration of damage models and study of the anisotropy. Mechanical testing of sheet metals: design of new tests and fixtures. Application of the VFM to different situations: large strain plasticity, vibration damping, high strain rate testing etc. Using of simulated experiment to optimize the identification process. 6 months at the University of Reading (UK) under the PhD course under Prof. Tony Atkins. Collaborations with the Impact and Crashworthiness lab of Prof. Tomasz Wierzbicki at MIT (US). Reviewer for Strain (Wiley-Blackwell) and Experimental Techniques (Wiley-Blackwell).